While doing some research for a possible roadtrip across the Westcoast of the United States we stumbled upon this exhibition at San Francisco International Airport. 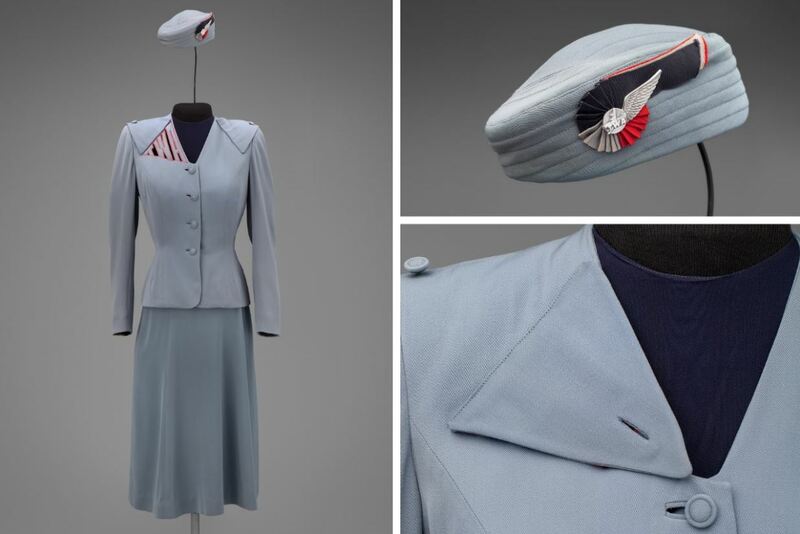 Celebrating 85 years of airline fashion, Fashion In Flight: A History of Airline Uniform Design, provides an overview of this unique type of women’s wear from 1930 to the present. Featuring over 70 complete ensembles and accessories from more than thirty designers and fashion houses like Dior, Balenciaga, Yves Saint Laurent, Oleg Cassini, Vivienne Westwood and others, Fashion In Flight reveals the design history and evolution of the airline uniform, its iconic status in popular culture, and its dynamic relationship to the world of fashion. Transcontinental & Western Air hostess uniform by Howard Greer. 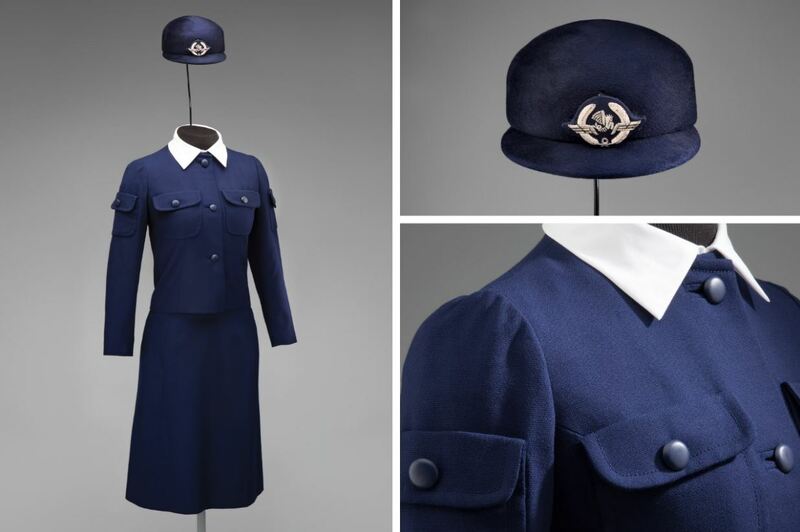 In 1944 Greer, a Hollywood fashion designer, created this fitted suit in light blue wool gabardine. It was known as the “cutout” for the openwork TWA lettering on the shoulder. With suggestions from supervisor of hostess services Ida Staggers, Greer introduced the “blou-slip,” a combined undergarment in rayon and satin that did not need constant tucking in. The triangular jacket flap could be unbuttoned to cover the TWA lettering, allowing the hostess to smoke or have a cocktail while off duty. This style of uniform was worn until 1955. Trans World Airlines hostess uniform by Oleg Cassini. Paris-born American Cassini became well known as a designer for Jacqueline Kennedy whilst she was First Lady of the United States. In 1955, he introduced a fitted suit for TWA hostesses that was issued for five years. In a medium brown wool for winter, this summer version in lightweight green wool had a collarless jacket and belted skirt. The embroidered lettering was repeated on the cotton blouse. The colors were coordinated with the cabin interiors of the airline’s Lockheed Constellation for trans-Atlantic service. Pan American World Airways stewardess uniform by Don Loper. This wool suit in Tunis Blue created a fresh look with sharp, angular features exclaiming the aerodynamic mood of the exciting new jet age. The fitted jacket’s hourglass shape was emphasized by the slant of the triangular faux pocket flap, swept-back cuff, and partial peaked collar boldly traced by the blouse. A matching pencil skirt with a deep kick pleat completed the silhouette. The hat with forward fin and white piping completed the look which was introduced in 1959. Fashion In Flight traces uniform design from the pre-war and utility fashion eras, through the period of engagement with European couturiers and Hollywood costumers that produced extraordinary collections for airline clientele during the 1950s, ‘60s, and ‘70s, to today’s select designers who are keeping airlines at fashion’s forefront. Braniff International Airways hostess uniform by Emilio Pucci. The Supersonic Derby outfitwas introduced in 1966. The harlequin-print nylon jersey, tights, and bowler hat havd Central American instruments and pre-Columbian art motifs. Footwear designer Beth Levine created the striped calfskin boots. Air France stewardess uniform by Cristóbal Balenciaga. Balenciaga’s 1969 winter suit, in navy blue woolen serge, perfected the semi-fitted look as it liberated the form and retained a lithe appearance. Overlaid flap pockets and a riding hat in satin velour created “la mode aéronautique”. The knee-length, shaped skirt had kangaroo pockets, while the turned down collar of the Terylene twill blouse added to the outfit’s liberating comfort. 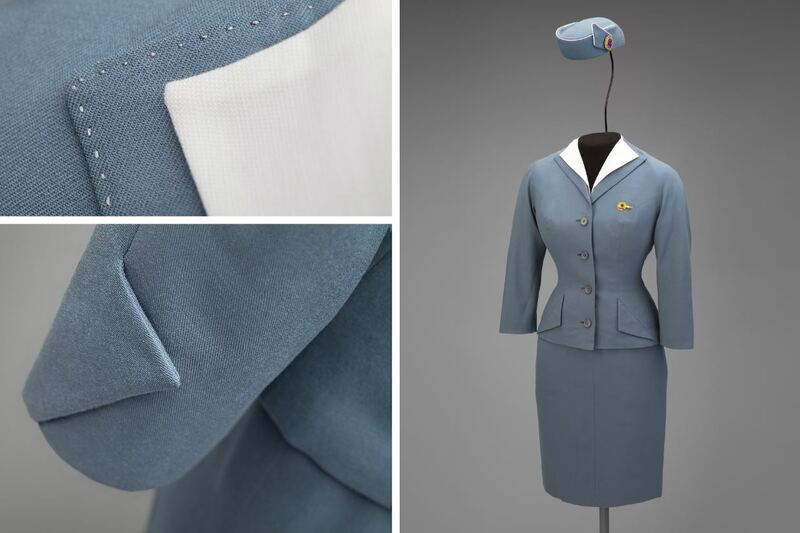 Pan American World Airways stewardess uniform by Frank Smith for Evan-Picone. 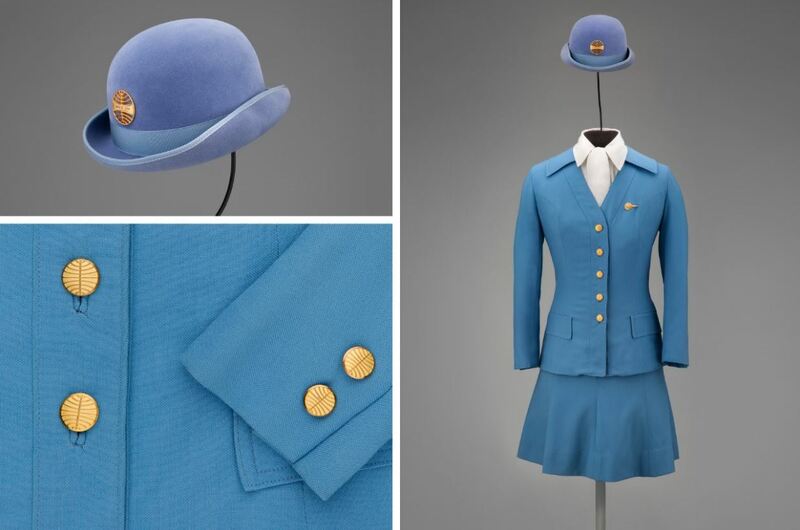 Dubbed “The Uniform for the Superjet Era,” and created for the new wide-body jet service, this uniform marked a new direction in Pan Am’s approach to fashion. It was created by Frank Smith, chief designer at career wear manufacturer Evan-Picone, to be “a functional and fashionable wardrobe that could be worn in all seasons, and of such quality that it would enhance the Pan Am image.” For the first time, the Pan Am stewardess could choose from two colors, Superjet Blue or Galaxy Gold. Fashioned after an English riding habit, it had a modified chesterfield jacket and a flared camisole skirt in polyester with the airline’s first above-the-knee hemline, and a cotton blouse with neckpiece. The bowler derby and reversible cape finished the damatic new look. 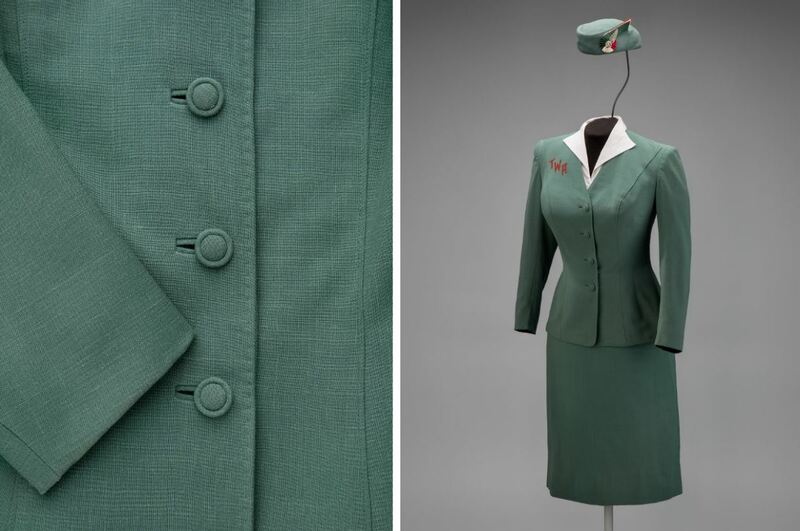 Trans World Airlines flight attendant uniform by Valentino. In 1971 Valentino brought his passion for color to TWA with a uniform collection that included men’s wear and pants for women. 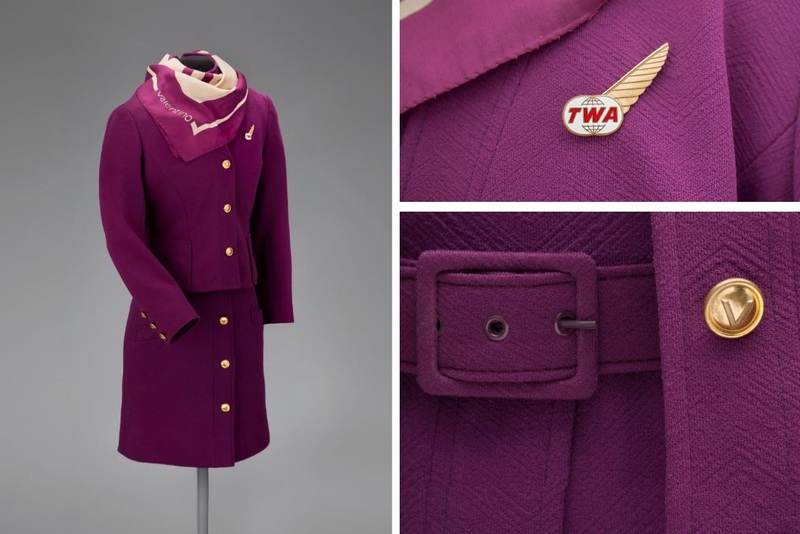 With a business-like look, this plum polyester knit dress suit had signature buttons and scarf. It marked a transition in airline fashion as age limits were removed and the profession became a longer-term career. Japan Air Lines stewardess uniform by Hanae Mori. This “fifth generation” JAL uniform was designed in 1970 for the airline’s first wide-body jet service. 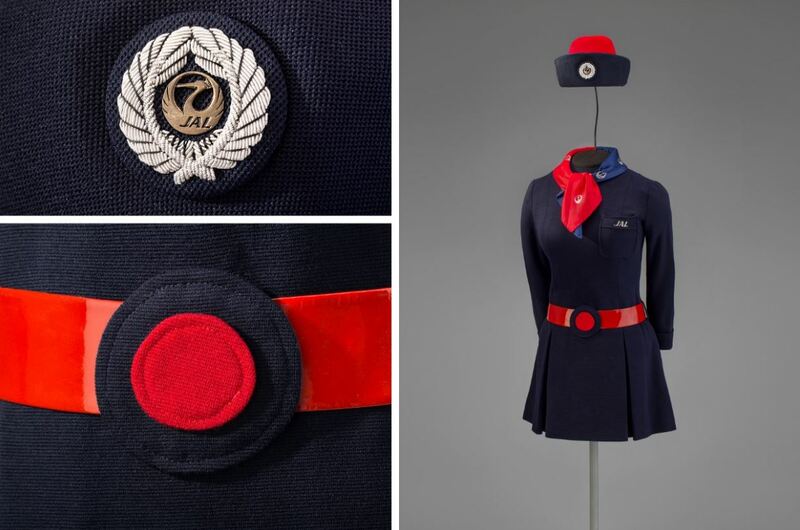 The dark blue polyester knit mini-dress was a striking departure from JAL’s earlier uniforms and was accessorized with a red belt, a semi-rigid bumper brim hat, and a two-tone silk scarf. 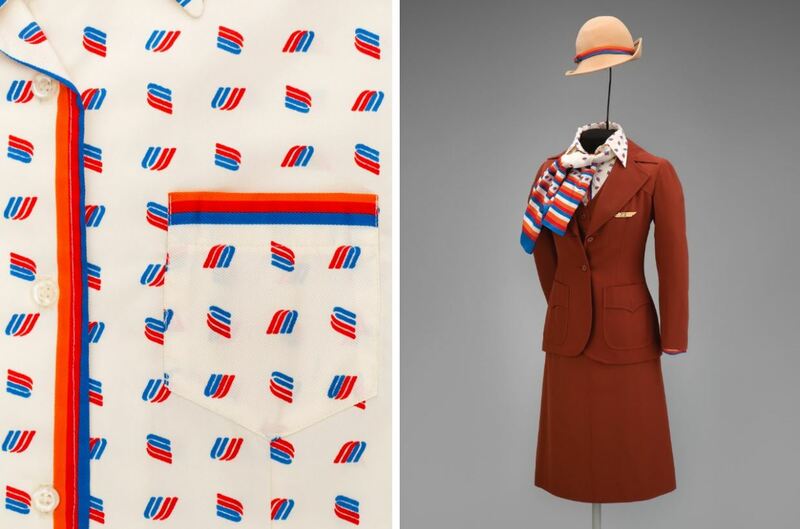 This United Airlines flight attendant uniform by Stan Herman was introduced in 1976 and in use until 1981. Herman’s western style all-season uniform, called Classic U.S.A., was worn over a cream colored long sleeve body blouse highlighted in orange, red and blue piping with a logo pattern. The optional hat with a narrow brim completed the uniform. 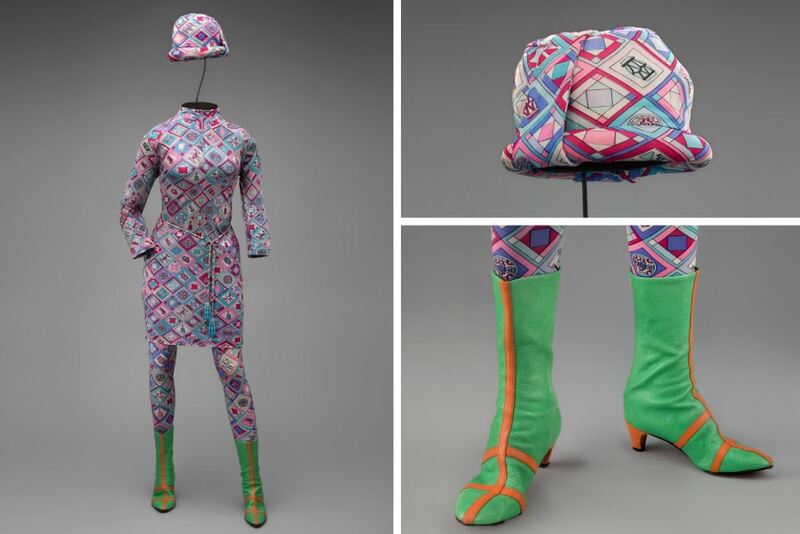 As air travel dramatically increased over the decades, designers were called upon by dozens of airlines to dress cabin crews in ways that projected brand identity, the excitement of the jet age, and the fashions of the times. Qantas Airways flight attendant uniform by Yves Saint Laurent. In 1986 Qantas introduced this uniform, which was worn until 1991. The cropped, tuxedo-style jacket had wide lapels, padded shoulders, and a narrow waist. 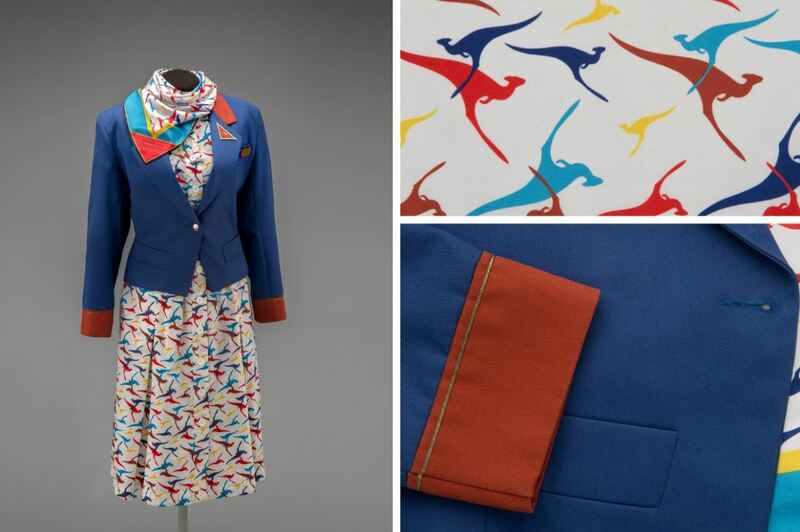 While the terracotta collar and cuff trim project a regimental formality, the colorful Qantas flying kangaroo pattern on the skirt and blouse added a festive air. Aeroméxico flight attendant uniform by Macario Jiménez. worn from 2008 to 2011. A black polyester knit suit worn with a skirt or pants. The trim, tailored look of the jacket and skirt was highlighted with red piping, a two-tone tie belt, and dramatic kick pleat. A multicolor scarf finished the outfit. 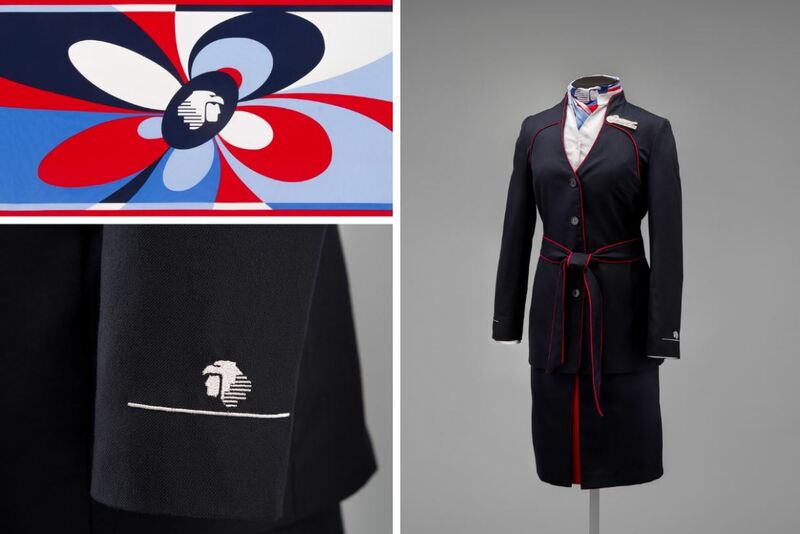 Virgin Atlantic Airways female flight attendant uniform by Vivienne Westwood. Westwood brought her unique style to Virgin Atlantic in 2014 with this current uniform to match the airline’s maverick attitude. In signature red, the exquisitely tailored suit recalls 1940s couture and Westwood’s earlier nipped-waist Bettina jacket with a darted pencil skirt. While some passengers often don’t pay a lot of attention to the people who ensure their safety and comfort during a flight, let alone what they are wearing, it is interesting to see how flight attendants’ or cabin crew’s uniforms have changed over the years. 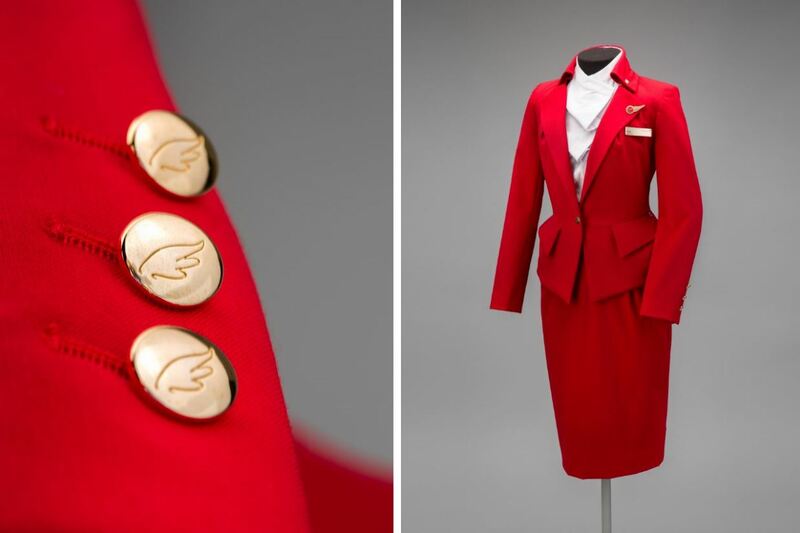 The exhibition Fashion In Flight: A History of Airline Uniform Design, at the SFO Museum located within San Francisco International Airport, is open daily from 10:00 a.m. to 4:30 p.m. and runs until January 8, 2017. Admission is free.